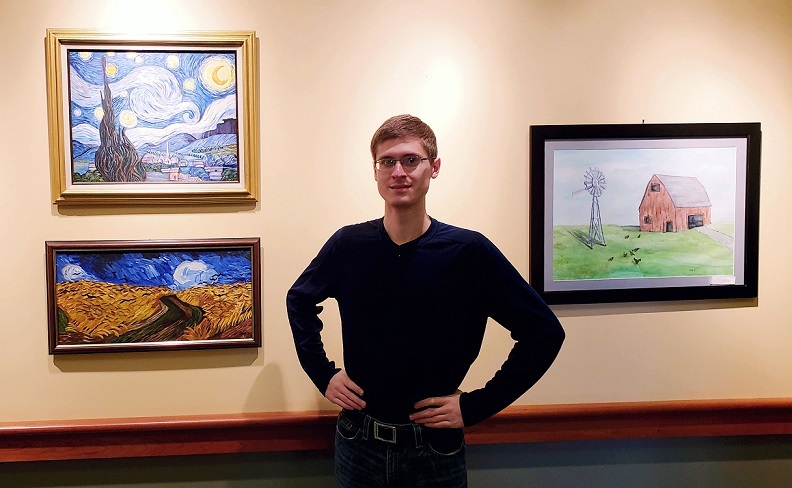 CLEARFIELD – Casen J. Zitzelberger, a local artist, was invited to display his artwork at the Lock Haven University Clearfield campus. A local native of Clearfield and recent graduate from Clearfield Area High School, Casen is a promising artist expressing images in acrylics, oils and watercolors. He has found his inspiration from the great artists, Van Gogh and Monet, layering paint to create texture and depth. His passion for nature and wildlife allows him to explore a variety of new places and animals, inviting the viewer to see the natural world in diverse ways. His mural depicting the Pennsylvania native red painted turtle will be displayed on the Clearfield Arts Studio Theatre building this spring. Casen has been recognized for his talent winning best of show at the annual Clearfield County high school art show along with multiple wins at the annual Clearfield County Fair. As an active member of the Susquehanna River Arts Center of Clearfield (SRACC), Casen serves on the committees supporting the up-and-coming artists in the annual Clearfield Area Junior-Senior High School and Clearfield County Fair art shows. His passion for art has led him to enroll at Brockway Center for Arts and Technology (BCAT) for instruction in pottery. Currently, his work is exhibited at The Liddle Gallery in Clearfield. Casen plans to continue his interest in throwing pottery at his home studio. Despite living with autism, Casen is driven to express himself through his art, and wants others not to judge people by their weaknesses but recognize and appreciate them for their strengths. Are The Hunger Games Books Only for Teenagers Or Can Adults Enjoy Them as Well?